The chores Mom wants to do! We want you to relax with us 7 days a week! 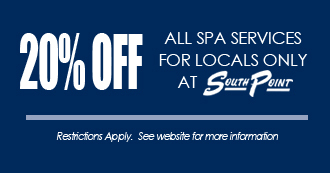 Locals get 20% off ALL services at Costa Del Sur Spa & Salon. For more information, or to make reservations, call 702-797-8030. Good on all services. Must show local ID for discount. Cannot be used in conjunction with any other offer. Management reserves all rights. Does not apply to facility passes or packages. Renew yourself with a stay in one of our Deluxe Rooms and a $125 Spa credit for Costa del Sur Spa and Salon! Click here for more information or call 1-866-791-7626 and ask about our hotel packages. Valid Through December 25, 2018.